Today, when it comes to fitness, there are few activities that are gender-specific. Women may tend somewhat toward cardio, and men may incline slightly in the direction of strength, but there’s little bias. Personal training, group exercise, high-intensity interval training (HIIT), and even the most intense CrossFit workouts—men and women are fairly evenly represented. When it comes to interests and performance, the two sexes may be equal, but critical distinctions remain. Women have unique preferences and tastes—especially when it comes to club locker rooms—and astute club operators are well advised to attend to the “likes” of this crucial member demographic. According to the 2017 IHRSA Health Club Consumer Report, women constitute 50.2% of all health club members. For women, the locker room is more than just a place to store their personal belongings and change into their workout clothes. A CBI survey of architects, designers, and leading IHRSA clubs reveals that many women regard this space as an oasis where they can relax, reflect, and refresh; indulge in some “me time”; and temporarily escape the incessant demands imposed by the outside world. So, in addition to considering the functional aspects of this area, operators should pay close attention to design and ambience, taking all of the five senses into account. “Dignity” is the word that sums up what a women’s locker room should be about, suggests the Momentum Female Health & Fitness Club, in Mechanicsburg, PA. “A clean, beautiful locker room is our way of showing respect,” explains owner Tracey Wakeen. The locker room experience should be simple, seamless, and satisfying from start to finish—from entrance to exit, says Hervey Lavoie, a principal at Ohlson Collaborative Design (OLC), in Denver. “Though it’s easy to overlook, the entrance is an important design element,” he says. Other tips by Lavoie include generous clearances to accommodate two-way traffic, the avoidance of blind corners and sharp turns, and the blocking of outside sightlines. At Momentum, “Only women are allowed in the locker room,” says Wakeen. “The kids have their own bathroom.” The arrangement helps maintain the calm, dignified, and, yes, clean environment that women desire. Clubs also should be alert to the inevitable impact of time. “They need to notice when the age of the facility interferes with the appearance of cleanliness,” Dunkelberger says. “Cleaning can’t overcome the aesthetic of aged materials.” Regular capital improvements have to be part of the equation. In 2014, when Wakeen purchased her club, she implemented just a few, but telling, upgrades—installing new carpeting and new toilets. “We put in these extraordinary, amazing, power-flush toilets, since we were constantly having problems with the old ones,” she says. “We still get tons of compliments about them. “I never thought women would be so pleased by something as basic as a toilet flush!” she says. If the plumbing isn’t working, she adds, no one will be happy. While men may be content with basic, utilitarian locker rooms, women, generally, are looking for something more. They’re tempted by and inclined to indulge themselves in warm, comfortable, and attractive spaces with a variety of enticing amenities. Pink, she says, is well beyond passé. In terms of appearances, “We recommend light, fresh finishes that feel welcoming. If warm woods are used for the lockers, the surrounding finishes should provide contrast with a lighter, cooler tone,” Amsberry says. Conversely, if light, cool colors are used for the lockers, the surrounding finishes should be warmer, or have plenty of warm accents. Another subtle but significant element is lighting, both for setting a mood and for functionality. The Women’s Club also offers complimentary coffee and tea in its vanity area. “Women notice and appreciate these things, and tell their friends,” says Evans. Music, too, can be tricky. Accommodating every taste is impossible, but light, soothing music can be effective in masking unpleasant extraneous noises. “Background music creates a safer feeling than a silent room,” says Amsberry. Evans is working on being able to play more soothing music in the locker rooms at The Women’s Club. 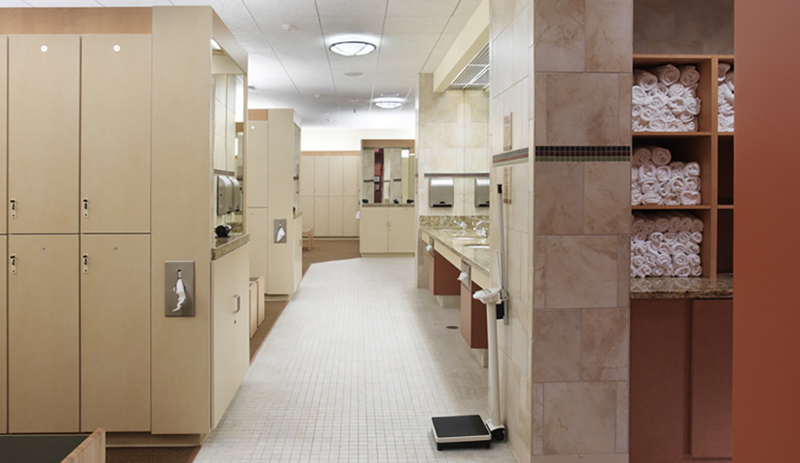 “Unfortunately, the music in the vanity area is on the same channel as the workout area. We can lower the volume in the vanity, but we’re exploring the possibility of putting that area on a different station to provide a more relaxing post-workout environment,” she says. “We want our members’ experience—with respect to every aspect of our club—to enhance their sense of value and purpose,” Wakeen says. Jean Unger is a contributor to Club Business International.